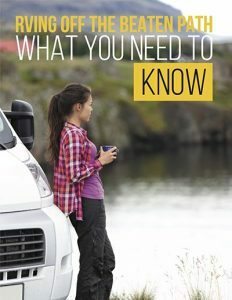 Top 10 Ways To Organize Your RV. No Skill Required. 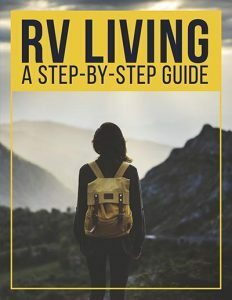 Top 10 Ways To Organize Your RV – No Serious Skill Required! Let’s be honest. As Americans, we love a good do-it-yourself show. Whether HGTV is remodeling a flipped house, or the Cooking Channel is demonstrating updated leftovers, we’re suckers for a good idea. The problem? Few of us ever have the skills to put the ideas into practice. 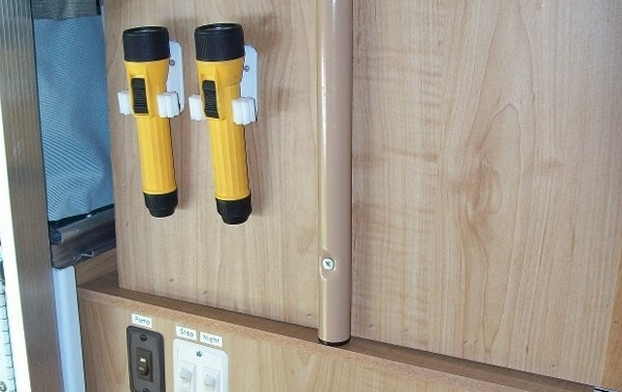 So, if you have been dying to organize your RV, but Pinterest ideas make you sweat… fear not! 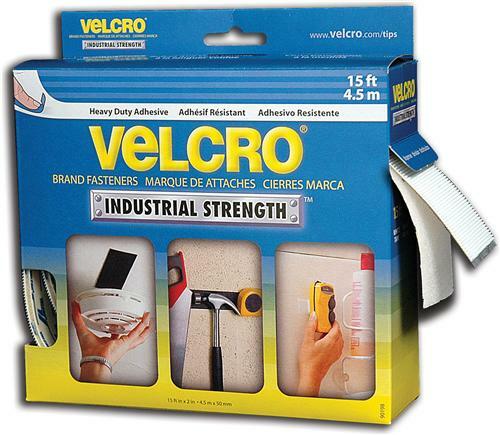 Commercial Velcro is available in an assortment of colors, including black and white. Commercial Velcro differs from traditional velcro, due to its industrial strength. It can hold up to 20 pounds of weight. (Yes, 20 pounds!) which makes it the perfect tool to use to organize your RV. Mount pieces to the back of a hand mirror, and hang it in your medicine cabinet. Attach over-sized toiletries inside your medicine cabinet to prevent shifting. It can also be used to secure, and hang, fire extinguishers in safe, accessible places. 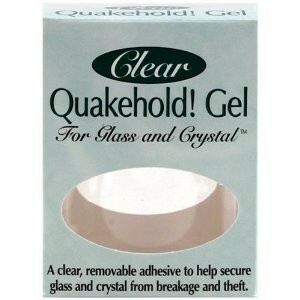 Quakehold Gel is the perfect way to display your finery, without having to put it away to travel. Do you have a vase, plant, or teapot that you want to leave out? Quakehold Gel will keep it in place, creating an inviting environment, even when you’re on the road. 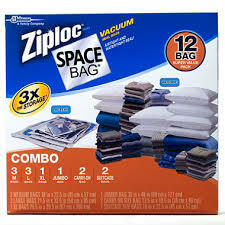 Space Bags allow you to take your items and shrink them. 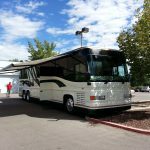 For RV organization, that means storing extra pillows, clothes, blankets and other bulky items with ease. Simply attach your vacuum hose, and the bags do all the work. Space Bags work best for bulky, air-filled items, like sweaters or pillows. They provide a perfect way to store your winter clothes, while wearing your summer clothes. Where should you store your items? 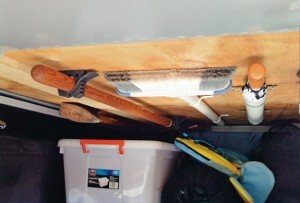 Most RVers utilize the space under their bed. Space Bags are perfect for under the bed, because they keep your items clean and fresh. They come in the following styles: cubes, large and medium bags, and hanging bags. Elastic bungee cords are perfect for keeping items that tend to shift. Use hooks to secure your cords. 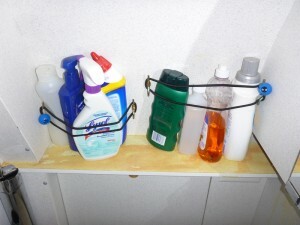 Kitchen bungees are available at several RV shops. These work great for keeping sink items in place. Bungees can also keep food from shifting in the cabinets, or under your bed, while traveling. Broom holders make great flashlight racks. Use them to create an emergency preparation area, without a lot of hassle. 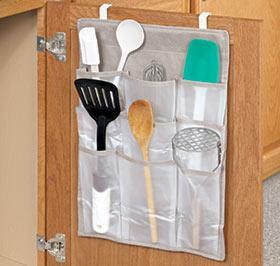 These organizers can literally be used for everything. You can hold school supplies, toiletries, kitchen utensils, outdoor camping needs, and more. Seat organizers fit over the back of your passenger seat, and can be used for similar storage. Plastic brackets can hold cleaning tools where you need them. Consider mounting them in your RV basement, or to the wall in a closet. 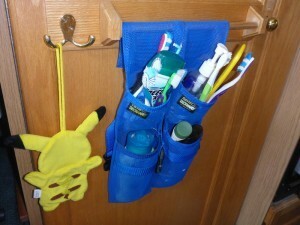 This gets your broom and similar items off the floor, and secures them for travel. Plastic cereal containers are the perfect way to add a garbage can into a tight area. Cereal containers are narrow and can be used near the passenger seat, the toilet, under the sink or even Velcro-ed to a wall! 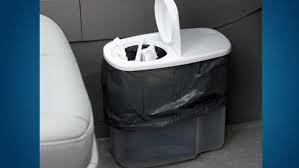 Containers of various sizes can be used for crayons, foods, toiletries, remote controls and any other item that tends to shift while on the road. Be sure to choose similar size containers that stack with ease. A variety of light-weight items can be hung from tension rods in your trailer. 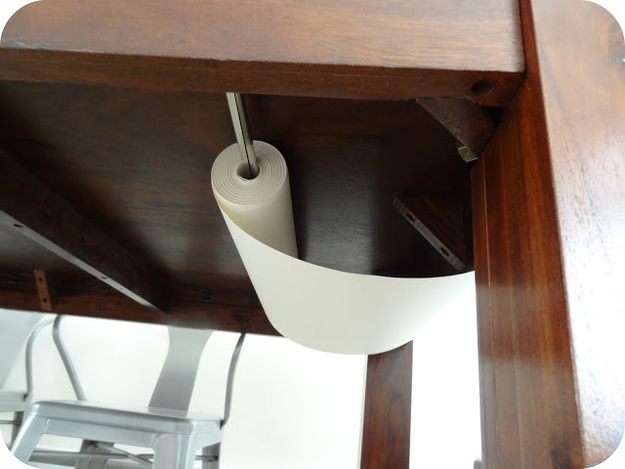 Try hanging your plastic and foil wrap in an easily-accessible place. You can also use a tension rod to hang drying clothes in the middle of the shower. Simply pop it up and hang your items. When you’re done, put it back with your broom. Use one under your sink to hang your cleaning supplies up, and still have room for things below. Hooks can be used for everything. Hang jewelry, emergency bags, beach bags, keys, mugs, the sky is the limit! There are over-the-door hooks, cabinet hooks, teacup hooks and light hooks. Every hook can be used for a creative advantage. Pinterest is a great source for “hook” ideas. Take a peek at what other people are doing to organize with simple wall hooks. Command Strips also make a line of removable hooks in a variety of sizes and styles. Command Strips can be attached to your walls without fear of damaging your interior (or exterior). Pantries can be easily organized by creating a modular kitchen system with containers. Foodstuffs should always be stored in marked containers. These can be used in or outdoors, wiped down and easily packed up. Containers will keep food fresh, and protect bags from breaking in transit. Keeping your perishables in plastic will keep bugs and other unwanted pests away from your food. Make sure to measure your drawers or cupboards for a perfect fit. If you plan to pack a 5-pound bag of flour, make sure that the container can hold at least 6 pounds, so that it won’t overflow when you snap the top on. 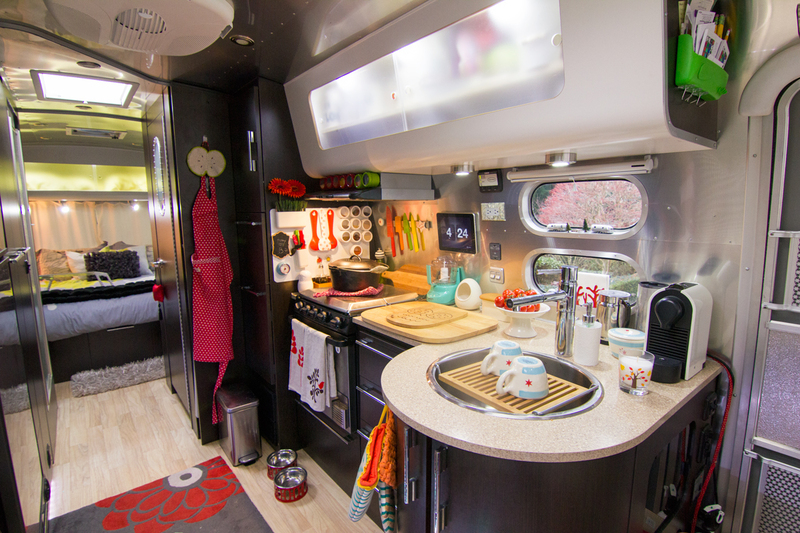 What tips do you have for organizing your RV or RV kitchen? Leave your ideas in the comment space below.